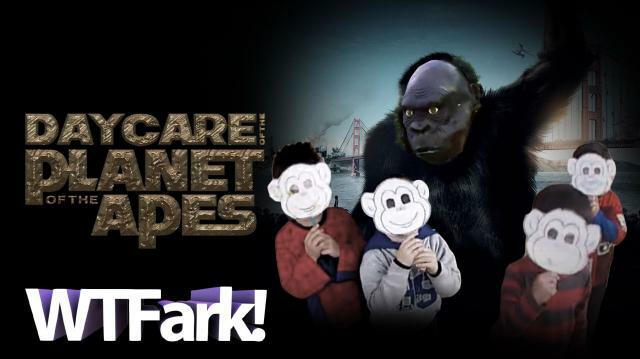 DAYCARE OF THE PLANET OF THE APES: A Garbage Man Wears A Monkey Mask To Visit A Daycare Center And No One Is Freaked Out About It. More from Ora: POOL WHERE’S MY CAR: Woman Drives Jeep Right Into Pool… During Pool Party. A garbage or “rubbish” collector in Wellington, New Zealand decided to combine three things: A mask, a truck, and “random children.” Once a week, he wears a monkey mask to pick up the trash at a daycare center. The children also put on monkey masks and pay tribute to their monkey overlord with gifts of cookies and cake. The unidentified monkey man claims he does it just for the laughs, but he’s not turning down the baked goods. Perhaps he will begin demanding tacos next. When asked about the incredibly bizarre sight of the monkey man’s ritual visit, daycare center employees said it was, “special.” We don’t disagree! Additional music by Kevin McLeod. POOL WHERE’S MY CAR: Woman Drives Jeep Right Into Pool… During Pool Party. BEER FACTOR: Little Old Lady Defends Convenience Store From Armed Robber. With Beer. MY DINNER WITH ALPO: Pet Store Owner Eats Dog Food For 30 Days. Why? Just Cuz.